The key to attracting visitors and converting them into leads depends on two factors: a buyer persona and the buyer’s journey. A buyer persona is a clear definition of the type of customer you are trying to attract to your business. A buyer's journey is the definition of the steps your customer will take from determining that they need to buy something to determining who they will buy it from (you or a competitor). In this blog post, we’ll explore how to best optimize your content for a particular location along the buyer’s journey (to learn about buyer personas, click here). Step 1: Develop an understanding of your buyer’s journey. Step 2: Create exceptional content tailored to a specific stage of the buyer’s journey and distribute it via the appropriate network. Step 3: Convert visitors into leads with inbound landing pages and high quality embedded offers. This is another way of stating the obvious: you cannot be successful in marketing and sales if you don’t understand your customer. Every customer goes through a process of discovery. They start having never heard of your business; they finish by buying your product or service. 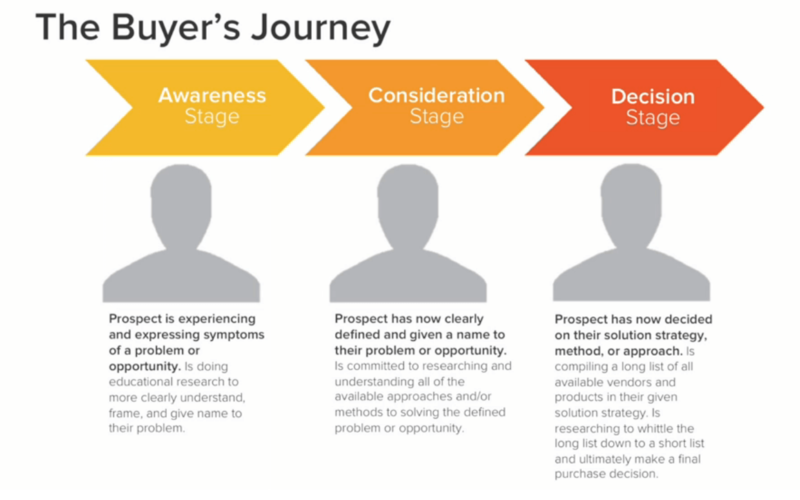 The “buyer’s journey” is the active research process your future customer goes through leading up to a final purchase decision. The basic principles apply to consumer electronics just as much as they do to million dollar software integrations. Think of something you bought this past month. Here’s an example...let’s say you just bought your wife a beautiful new iPhone XR. When did you first hear about the iPhone XR? At some point you became aware for the very first time that it even existed at all. That is stage one of the buyer’s journey: awareness. You probably didn’t decide to buy the iPhone XR on the first day you heard about it. Don’t get me wrong - I know there are people out there camping in tents to hold their place in line. For the rest of us, we thought about buying one for a while. We hashed out the ups and downs and did a quick subjective cost-benefit analysis. This is stage two of the buyer’s journey: consideration. Eventually you decide you just can’t take it anymore. The pain is too great. You need an iPhone XR for your wife. Now you’re in stage three of the buyer’s journey: decision making. You compare vendors, look for sales, and you eventually make a purchase. Journey complete! 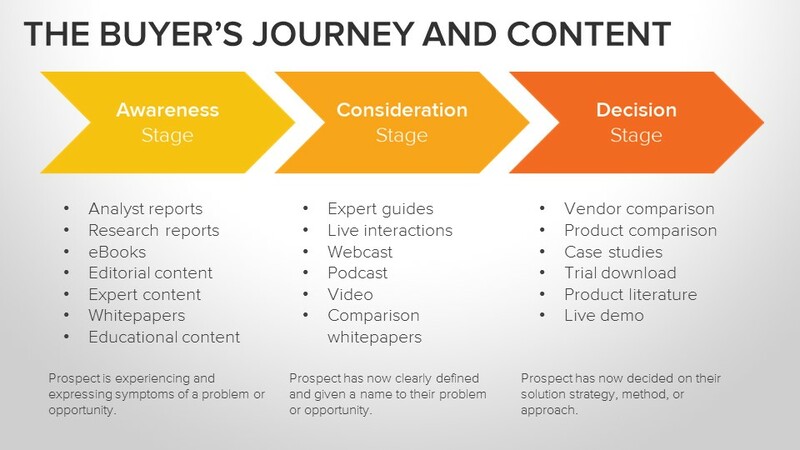 We can develop content focused at different stages of the buyer’s journey. Once we create high quality content we need to add context by tailoring it to relevant distribution channels. Content geared towards awareness: This might be a series of blogs distributed via social media, video advertisements, and infographics geared towards the features of the new iPhone. The content might be generated six months in advance of the release date and could be distributed on a progressive schedule ramping up in the month preceding release. Its focus is to let people know a product is coming, and perhaps provide a teaser. Content geared towards consideration: This content is more in depth. It might include discussions about possible vendors like Verizon or AT&T or video tutorials on new features and integrations. Content in this stage fleshes out the skeleton; it provides more information than awareness-stage content. Content geared towards decision: Content for the end of the buyer’s journey would include comparison tools where you can see how the technical and aesthetic characteristics (and pricing) of the iPhone compare to its industry competitors like the Samsung Galaxy. You have a large inventory of high quality content. You’ve distributed relevant content on relevant networks. Visitors are starting to frequent your website more often. Keep your website and landing pages simple. Embrace white space and clean design. Remove navigation from landing pages. Trade offers for lead information. Design with one thing in mind: conversions. 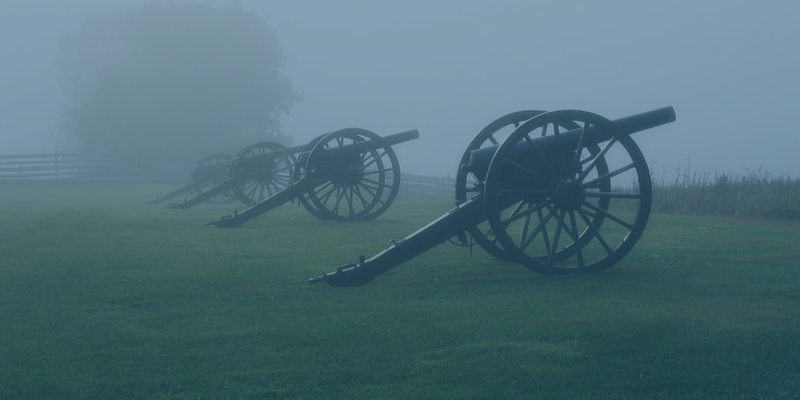 Don’t forget: implementing lead generation best practices is half the battle. Understanding your buyer personas is the other half. 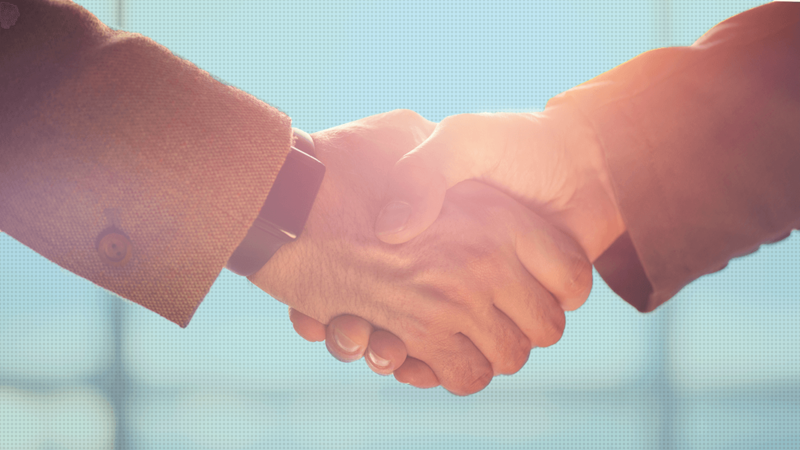 You still need to develop a sales process to nurture leads once you have them. 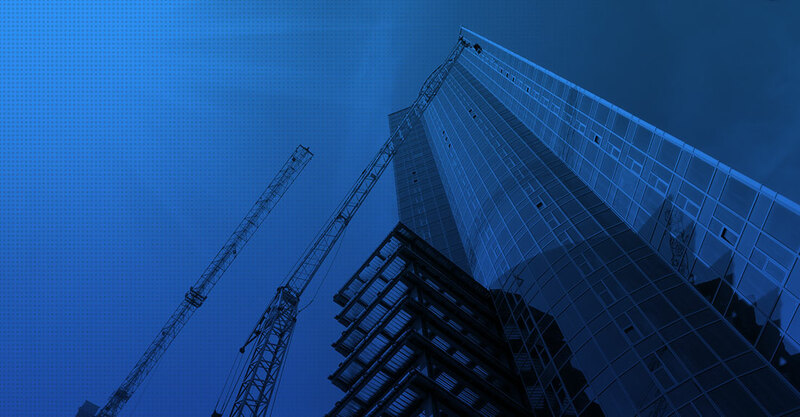 SAAS products like HubSpot that integrate with CRM tools like Salesforce and Microsoft Dynamics are perfect for this.